Here's a picture to remind you of the craftroom overview from last week. If you missed part 1 click here. This is the antique cupboard in the corner. I use it to display my vintage Oz books that were given to me by my Mom, and the Featherweight sewing machine I learned to sew on. I still pull it out and use it once in awhile. The Dollhouse Sweet Shoppe is above. This is a new piece of furniture. Now that son has moved out of town, we needed an extra sleeping spot in addition to the guest room. 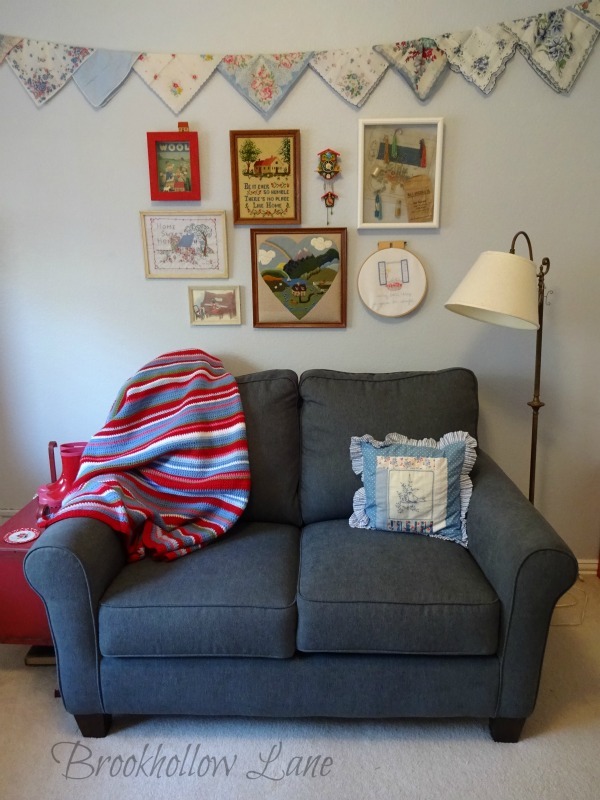 I also need a comfy place to sit and read and hand sew. This opens into a twin size bed. It's super comfortable to sit on. We've already used it twice during December. Notice the hankie banner at the top. Little shelf I use as an end table holds my crafting books. The little tin plate is my coaster. Bowie loves to eat coasters, and he won't touch this one. My little framed goodies above the sofa.Some of them are vintage, and some I made. The shadowbox frame in the right top corner was a beaded purse that my great grandma was working on. I framed the unfinished piece with all the strings of glass beads. Going on around the room, this is the closet door. Here's my wrapping paper and a few of my Dad's yardsticks. Inside the closet-my Elpha hanging rack for paints, glitter, ribbons on the door. You can see my bins of felt and wool. Everything else I use is stuffed in here. Here's the end of the narrow closet. More bins, vintage books. See the old sewing machine on the bottom right? More on this at a later post. On the right wall I hang my apron, iron and plastic quilting rulers. It's filled to the brim! Here's the last cabinet. 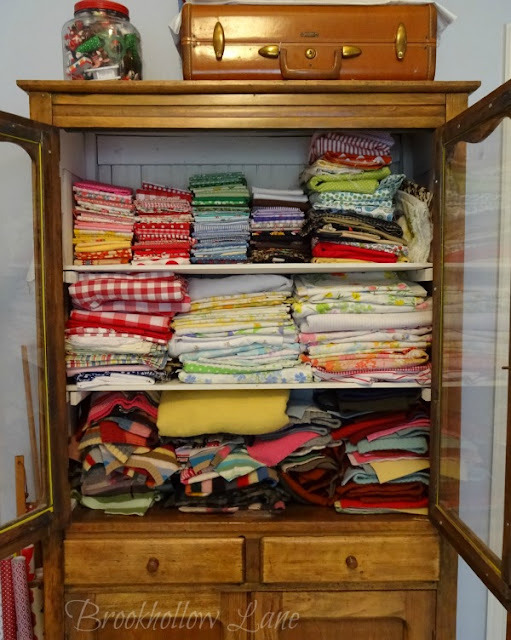 An antique pie safe filled with all my fabric and fat quarters on the top shelf. Vintage sheets on the middle. Felted sweater wool is on the bottom. Old cookie cutters and vintage jello molds are in the drawers. And we're back where we started. I hope you liked the tour and maybe got a few ideas. If you have any questions, just leave a comment and I am more then happy to help if I can. Lastly, we had an overnight guest over the holiday. This is Sofie. 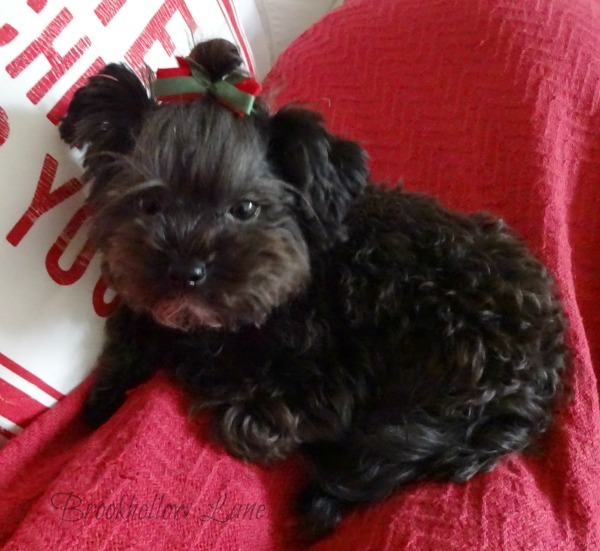 She is a 3 1/2 pound Yorkiepoo. She is full grown and is quite the little diva. Bowie is about 8 1/2 pounds and you can see he looks like a giant next to Sophie. He really didn't want any part of her as you can see from the picture. He kinda looks a little disgusted, probably because she was getting all the attention. It looks so good! So colorful but neat and organized. What a fun space to work in! Your Bowie is so cute but yes, he does look a little annoyed with the little one. She is so adorable!! Have a blessed Sunday! Thank you, Vicky. He was annoyed with her and not playful at all. I guess he thought his space was shared and he didn't like it! I don't know about that Judy-you seem pretty organized to me. Especially getting your new house and all those projects in order. Thanks! Diane I've found space in all kinds of weird places. I always use the insides of doors. I love the Elpha line at Container Store for the door hangers. Hugs to you! The puppies are stinkin cute...your closet storage is so organized! 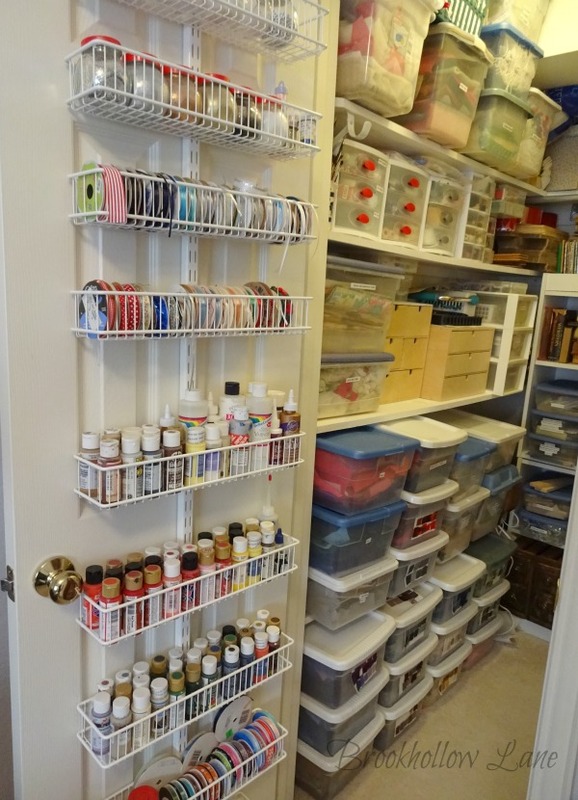 Your craft room inspires me. I was working in mine today..it's a mess! Aren't they the cutest? Mine gets to be a mess too-when I'm working in it-don't be fooled. Thanks so much! 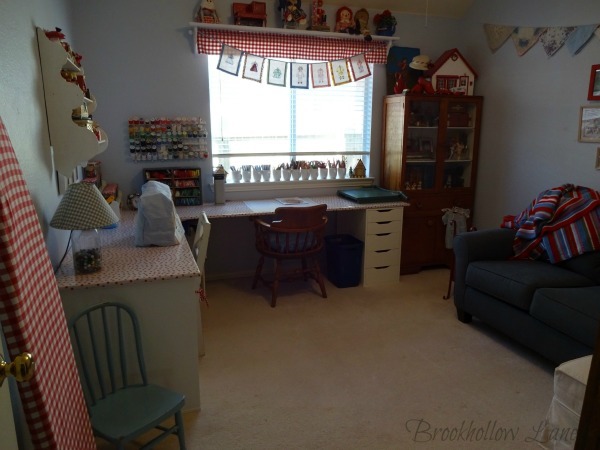 I do believe I could be so much more productive if I could just transport your craft room to our house, Leslie! There's so much eye candy that I have to go back and look at it all again. 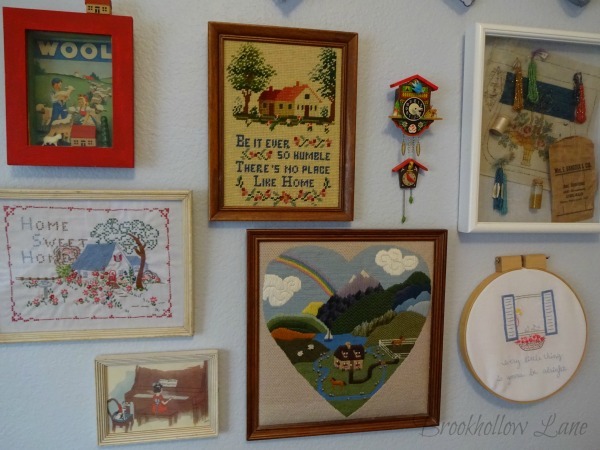 Your gallery wall with the framed beaded purse in progress and the cute cuckoo clocks and embroidered pictures...sigh. I have the same red piano! 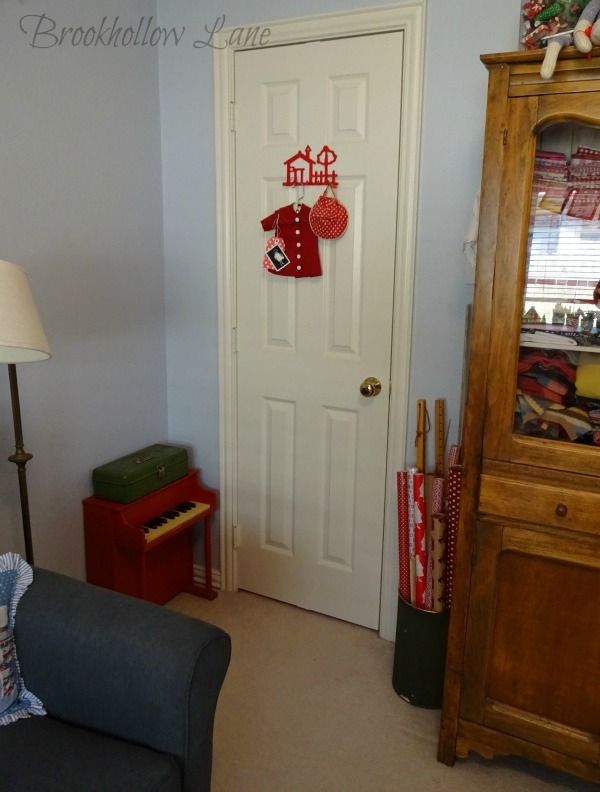 Your closet is organized to perfection, right down to the adorable coat and hat hanging on the front of the door. And your pie safe is a sister to my much smaller version I'm using as a tv cabinet. And all the red accents bring joy to the room!! Your 2 little buddies are so darn cute. woof. Thank you so much for sharing your creative space with us, Leslie! Awe Vickie. I din't known you had the same little piano-I just love it.I have loved sharing my space. You're too sweet! Hi Leslie, WOW your studio is amazing. Can I have it in my house??? So organized which I love and such a great use of all the wall space. I have no wall space and what a difference it makes. Having the darling sofa seat is perfect. LOVE your closet organization. Your ideas for storage are awesome. Seeing your corner cabinet with the books and treasures is so special. Love the hankie banner too. You are so talented my friend and your space makes me want to start all over in mine!!! I can see you enjoying hours of creative time in your well planned studio space. The pups are precious!! Have a great week and stay warm!! brrrr we are cold. Great time to craft!! Thank you again, Celeste. I hope to spend some time in here, especially with the cold weather. I think your space is so beautiful, you wouldn't want to change a thing! Happy crafting. nice comments on my blo. I knew you meant blog.Ha Ha! I just love your blog and it has been a real inspiration to me, especially your home decor. Love your hutches so much, Kathy! I love it all, but you probably knew that my heart skipped a beat when I saw your adorable dollhouse. I remember it from earlier posts. You have such beautiful treasures in your special space. 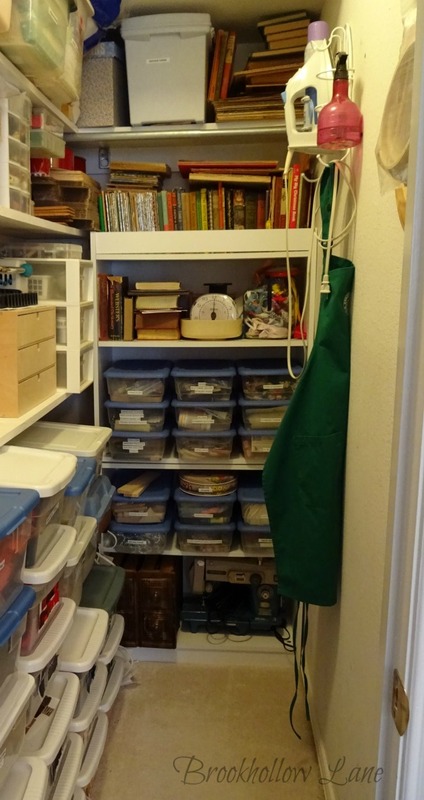 I wish I could say that my craft room was all neat tidy. It's better than it has been in a long time, but it's stuffed full of estate sale treasures. I need to stop buying vintage toys. I'm addicted!! Keep the inspiration coming. PS. I'm going to have to hide your blog post from my girls. Our two cats have quite the personalities but my girls keep insisting we need a dog too. Your precious furbabies would make my girls crazy with happiness. Thank so much Kim. I really had to do a cleanout-way too much stuff. I haven't been thrifting in over a month. I feel like I'm going cold Turkey on that. The dollhouse is super inspired by yours, you know. Hope you are staying warm!! 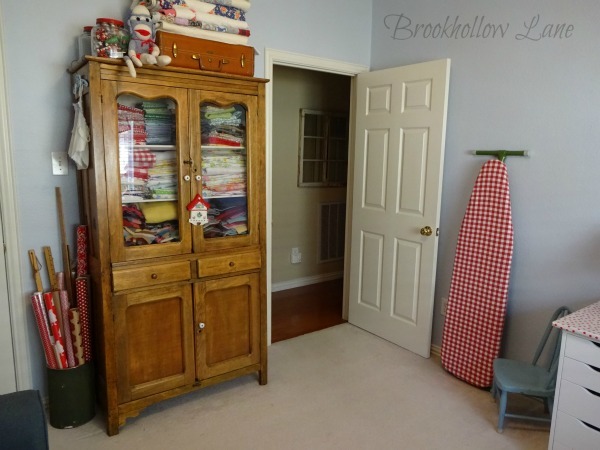 Your craft/sewing room looks great. Thank you so much for sharing. I love seeing all your pretties. Sophie and Bowie are so cute and look so sweet. Hope you are having a great week my dear. Thank, Donna. Love sharing it all with you. Aren't the fur baby's cute? I just love them. Hope you have a wonderful weekend too! Your room is really great. I'm in love with your wooden chair! Thanks, Magali. I kinda love that chair too. Have a great weekend! wow...wish I was a tenth as organized as you....everything looks perfect.. It's far from perfect, but at least I can find most stuff now when I'm looking for it. Thanks so much! 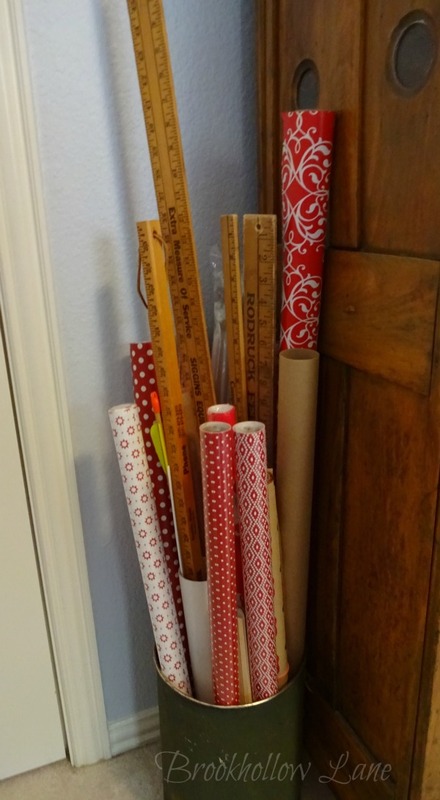 Gosh your craft room has really got some good organization tips in there! And that storage room is a veritable treasure trove I should think! I think you're making a lot of people jealous just trying to guess what kind of things you've got hidden in there for the next craft project!